The Joint Admissions and Matriculation Board says any candidate that cannot be identified through biometrics will be barred from writing the ongoing Unified Tertiary Matriculation Examination . The board ’s Head, Media and Information Department , Dr . Fabian Benjamin, disclosed this in an interview with the News Agency of Nigeria on Sunday in Lagos . Benjamin spoke against the backdrop of some reported cases in some centres where some candidates could not be identified through JAMB’s electronic system . NAN reports that the 2018 UTME which commenced on Friday, March 9 , in 605 centres nationwide , ends on March 17 . “ We want to clearly state here that any candidate who cannot be identified using biometrics will not be allowed to sit for this examination . “ So far , over 450,000 candidates have sat for the examination and we have had reported cases where some of the candidates could not be identified as they placed their fingers on the machines for identification . “ Candidates sitting for this examination are not to be identified by mere registration numbers or names, but through the machines . “ We know that at the point of registration for this examination , candidates’ details were captured with live photographs as well as their fingerprints . 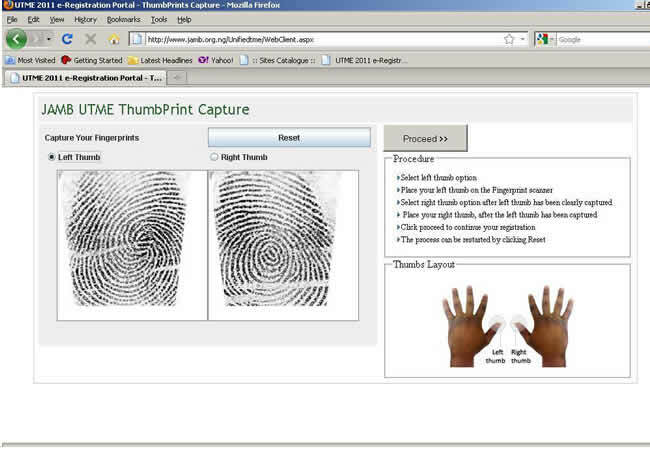 “ So , while going for the examination , it is only expected that candidates should be screened and identified using biometrics . “ This method should be able to call up candidates’ identity and so, there is no way a candidate will just come and mention his name and registration number and be allowed in without going through the right process ,” he told NAN . Benjamin said the measure was to ensure the eligibility of candidates and reduce cases of impersonation . According to him, the board ’s personnel are fully on ground to ensure a smooth conduct of the examination and attend to any technical hitch in all the centres . The JAMB spokesman said : “We also assure the remaining candidates of this ongoing examination that they have nothing to fear as we have ensured that the cables , systems and backups in the various centres are fully operational and hitch- free . “ So far, we are happy with the way the conduct of the examination has gone nationwide and we are hopeful that it is going to get better while it lasts.